Do you want to make a real difference in the lives of people who are suffering from a rare neurological disorder? The Eye on Vision Foundation 501(c)3 is one of the only charity's in the world raising money for much needed research into visual snow syndrome. What does this mean? Why is it important? If we cannot raise this money, research efforts will suffer, and those of us suffering day in and day out will have no hope for a treatment or a cure. If there was ever a way for you to make a positive impact on a person's life, this is it. Your donation will not get lost in paperwork and accounting, it goes straight to the research. Visual Snow - What is it? Visual snow syndrome is an untreatable neurological disease that devastatingly affects a persons vision, hearing, thinking, and physical body. Many of the symptoms a patient experiences are constant and do not come and go. Symptoms vary from patient to patient, but all patients with visual snow syndrome see static (similar to bad TV reception) everywhere they look. My visual snow story started around the age of 6. I was young, so I'm not exactly sure if I was 5 or 6, but I clearly remember going to my mom in first grade and asking her what the flying dots I was seeing in the dark were. She thought I was talking about floaters, told me it was normal, and that was the end of that. Two years later my teacher contacted my mom telling her that I was having trouble seeing in school. My mom took me to the eye doctor and we learned that I was legally blind. Fortunately I was able to be corrected with glasses, but the doctor seemed baffled how this could have gone missed. Looking back now I wonder if the start of my visual snow two years prior had something to do with it. In 2005 my visual snow progressed to the full blown syndrome. I was experiencing worsening visual acuity, floaters, after images, loss of contrast sensitivity, ghosting, glare, halos, starbursts, tingling and numbness in my body. I was hospitalized and had every test run that was available and no doctor anywhere could figure out what was wrong with me. I was sent home time and time again from tests with doctors confused and questioning what was wrong with me. After many months of research on my own I came to realize that I had a little known condition called visual snow. Sadly, there was no research being done for the condition, so I started a non-profit and went on a quest to find a cure. In 2011, I was contacted by a visual snow patient whose neurologist was interested in researching visual snow. The research began in 2012. In 2014, my visual snow syndrome progressed again with worsening symptoms and new symptoms of tinnitus, head and ear pressure, trails, night blindness, along with another regression of my visual acuity (the eye chart test) and the development of more floaters. Then I underwent another worsening in 2016. There is not enough known about visual snow, so we do not know how much is reversible and treatable and how much is permanent damage. The changes that some patients have experienced to the eye itself are permanent (visual acuity loss and floaters). The changes to the brain are hopefully reversible. Time is crucial to this research. Myself, and many others like me, are counting on you to donate to the cause or share this story so that we can live our lives like we want to. Simple pleasures like going to the beach, reading a book, going for a Sunday drive or watching the sunset are too visually taxing for many sufferers. Because so little is known about visual snow there is no official documentation on whether this is a genetic condition or not. Nothing official, but sadly we have conducted our own surveys, and yes, the responses are too overwhelming to ignore. There is a genetic link to visual snow. Many of us living with the condition, who are parents already, are terrified that we have passed this along to our children. Then there are those who haven't had children yet who are too scared to in fear of passing along the condition. More and more parents, and even the children themselves, are joining the support group for visual snow on a weekly, sometimes daily basis. We see young kids coming scared, looking for answers, and treatment, that can't be offered to them. Other visual symptoms include: night blindness, light sensitivity, flashes of light, glare, halos, starbursts, dry eyes, blind spots, vision blacks out with one eye closed, yellow-tinted vision, double vision and loss of accommodation. In 2015-2016 Eye on Vision Foundation funded a German study into Visual Snow led by Dr. Schankin. The results of this study should be released at the end of 2016. Prof Goadsby is now putting together a new phase of research to take place at King's College London, England. It is our hope that this imaging study will begin in late 2016 if funding can be secured by EOVF through generous donors like yourselves. We are reaching out to supportive people like you to help us raise $570,000 through GoFundMe in time to support the next phase of research into visual snow. All funds donated will go towards the research efforts to find a treatment for the many who are suffering with this condition every moment of their lives. Since July 2014 we have raised over $80,000 through GoFundMe and we continue to work day in and day out to raise funds through grassroots efforts. Every dollar that we receive makes a difference. Every single dollar counts! Please note that $50,000 of the GoFundMe dollars raised that you see in our totals were used to pay for the study in Germany. The remaining balance has been sent to Pof. Goadsby's research efforts at King's College in London. We cannot afford to give up because this money is crucial for visual snow research. Please become part of this movement to find a treatment or better yet a cure. What would you do if you or a loved one were diagnosed with an untreatable condition? I hope that you would do everything in your power to raise those funds, to fight for yourself or your loved one. There is no government support for this, no grants have been offered yet - it is just you and me. Every dollars counts more than you know, but even if all you can do is forward this link to as many people you know, or share this campaign on Facebook, you will be making a huge difference. 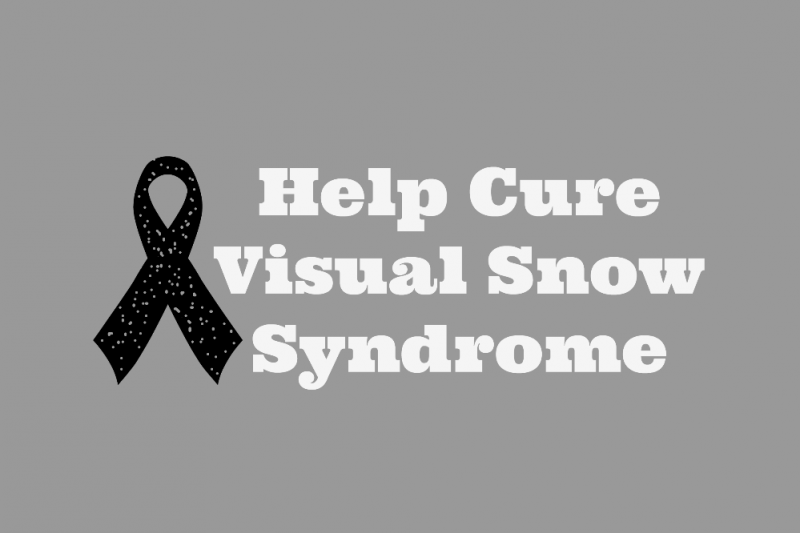 Help Cure Visual Snow (GoFundMe) was created as part of our own non-profit 501c3 Eye on Vision Foundation (Tax ID: 20-5394501) There are no paid employees or personal medical expenses taken from the foundation. All donations made here are tax-deductible. And: Visual snow has been recognized by the International Headache Society as a new disease in the appendix of the International Classification of Headache Disorders 3rd edition ( https://www.ichd-3.org/appendix/a1-migraine/a1-4-complications-of-migraine/a1-4-6-visual-snow/). This gives a diagnosis for all patients affected and a clear target to be addressed for future research! The Visual Snow diary study is still looking for more patients to participate. This study can be done from home, and is non-invasive. and you will receive an email back with information regarding the study! Still looking for more participants for the Visual Snow study. There are two parts to this study. No matter which study you would like to participate in, you must fill out the below questionnaire and email back to the researchers. Anna, please remember that there are very varying degrees of Visual Snow, some people find it completely life changing, particularly those who were not born with it. Since onset I have had a migraine headache every day of my life and my vision has been severely affected. This has changed the path of my life drastically and caused depression and anxiety to worsen tenfold. Please spare a thought for those with VS who have not been as fortunate as you. Its fortunate that there are lucky people like Anna but that is not the case for everyone. The non visual symptoms are for many the worst part. Sufferers have varrying degrees of both visual and mental symptoms. I had to drop out of an honners physics program despite a 4.0. My depersonalization and brain fog are so intense that I can no longer comprehend what I used to. When symtoms flare up it takes me a while to process even a simple sentence. The constant static and ringing on top of that make me feel that ive gone mad. I would die if it meant having 10 minutes to feel and see the way I used to. Just to sit atop a beautiful mountain one last time and feel the sense of beauty and wonder I used to feel as a teenager. For many, this is definitely a debilitating disorder. I met with my doctor this morning and one item was my large floater. I told him and showed him that I was testing a magnetic field pulling the floater to one side of the eye. It's not original, others have tried a magnetic on one side of the eye. I'm getting about a 20 to 30 percent improvement over 8 weeks of testing. He is going to provide a serious case of floaters (patient) for me to test along with me at no charge. It's a very inexpensive solution. The only thing I've done new was to increase the magnetic field with much higher energy magnets. ( very small). This ends up on the glasses and invisible with dark glasses. I told him, I want the worse case he has. I got visual snow over a year ago. Mine was caused by Chronic Inflammatory Response Syndrome (otherwise known as Biotoxin Illness). It has gone down considerably with treatment although I still have floaters and tinnitus. It's diagnosable with bloods tests which my insurance covered. My body is in a constant state of inflammation because of exposure to either lyme or mold or both. It is genetic in that I have a gene that doesn't allow me to detox properly from the biotoxins that mold or lyme produce. I have to detox the biotoxins in order to get better. I'm just starting the Shoemaker protocol which should help alot as well as getting my house tested for mold and I'm wrapping up my treatment of lyme disease. It took awhile to figure this out as there are only a handful of doctors who treat CIRS. I've had visual snow my entire life... and from what I've experienced, it's hardly a 'devastating' disorder. For most of my life I thought that was how everyone saw. The vast majority of the time, I don't even notice that I have it. My daughter (5 years old) has visual snow. The first night it occurred, she woke crying and kept looking all around at her arms saying that bugs were jumping all over and to get them off. She was terrified and it was scary and heartbreaking as a mom watching her react to things that I couldn't see. She has had visual snow ever since and that was almost 2 years ago. She calls them tumbleweeds and talks about them openly. They are the most prominent in the dark, but she also sees them in the light. She has photosensitivity and experiences headaches fairly often. She also complains often about her body "fizzing" and tingling. As far as genetics, I am not aware of anyone else in our family that suffers from visual snow. As a mom, I read often about this syndrome and pray for answers and a cure or anything that will help the symptoms. Love to all who experience this syndrome, my heart is with you. May God bless this research to unfold new answers. I have had VS my entire life, and no one ever believed me. Ever since I was a little girl I complained about it. I even told my doctors, but my parents and my doctor just assured each other that as a child I had a creative imagination. Now for 21 years I have lived with it, and it is only slightly worse. I wish I could make a donation to put in, but at the moment I am unable. Hopefully in the future I can help make a difference. But for now I hope this doesn't get worse, and I pray for you and what you are going through! Stay strong. I know there are people out there who will make this happen! I went 22 years without this issue and randomly all of a sudden it developed and got progressively worse. Some days I can't read without having the object up to my face where people suggest glasses but the optanologist just asks me if I have been checked for MS. I have to stand two feet away from my flat screen TV because I can't read the TV guide. I could go on but why would I. I'd love to pretend everyone is so lucky it doesn't interfere with their everyday life but I'm lucky enough when I wake up it isn't as bad and sometimes lessens at random times during the day. A cure would be great because it does interfere with my everyday life considering I'm a medical professional. I also suffer from visual snow and tinnitus. Mine was brought on by a course of antibiotics + steroids. As you said, most docs haven't even heard of it. If enough of us band together, maybe research will seek a cure. If you hear anything, please let me know. I am a Chinese student with Visual Snow,What do you know about the latest research? Both me and my son have it and the eye doctors never even heard of it. I don't think it is that rare I think no one understands what it is. I complained for years doctors just act like your crazy so you don't bring it up anymore. I actually find it infuriating to read comments like Anna's. You would think that one could actually receive unmitigated support on a Visual Snow research page, of all places. It is not only ignorant but narcissistic to assume that one's own experience with a disorder is equivalent to everyone else's, analogous to a cancer patient who became cancer-free after one surgery scoffing at and questioning those whose cancer almost takes their life. Anna, you may wish to read a bit more about the varying forms and severity of VS syndrome--after all, it is a syndrome, which indicates there is variation--before making pronouncements. Wish I could donate all the money I wasted at doctors, neurologists and specialists who all say there is nothing they can do. So pissed! I thought I was going insane until I discovered VS. I can't tell if it's worsened significantly the past few months or if I'm just now noticing how truly bad it is. I also am nearsighted, so my vision is horrible. I wear glasses but I need new ones. I usually see dark static with colors occurring as well. I see floaters, ghosting, afterimages, halos, starbursts, etc., which are worse when I'm wearing my glasses (as I said before, I truly need new ones, but I can't afford it at the moment). I also struggle with anxiety and derealization/depersonalization. My anxiety makes me overthink this and I am struggling. It's like torture to have endure this everyday. I really hope they find a cure, or at least some sort of medicine we can take to make the symptoms less intense. Hi I want to donate, but I don't have a creditcard. I'm having visual snow symptoms for 4 years. Floaters, after images, silvers specks flashing and so on. I'm a cameraman so this really effects my work! Is there another way to donate? I've had VS as far as I can remember--since at least before the age of 3. Mostly, I ignore it. It can be a bit of a trip sometimes at night when exposed to brief, bright light when well adjusted to the dark. The tinnitus is probably the more annoying aspect as I cannot wear noise-canceling headphones without being in pain. I've had visual snow following drug usage in my early twenties and it was barely noticeable until about a month ago when it suddenly got worse. I can see the static on many surfaces, even during the day time. I also can see after images, eye floaters, starbursts, ect. I cannot decide which symptom is worse; they all bug me to no end. I hope the cure is close by, or at least an effective treatment. We are not alone in this. I've had VS since I was 7 years old, I'm now 36. It's become a part of my daily life and I've learned to live with it, however I have trouble driving at night and it has affected my quality of life. I hope a cure can be found one day. I have VS since my childhood. Thank you for your commitment to research.